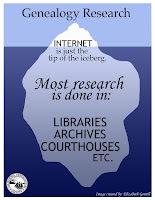 California Genealogical Society and Library blog: "Tip of the Iceberg" Poster Debuts at Jamboree! "Tip of the Iceberg" Poster Debuts at Jamboree! Back in March I reported on an idea based on a conversation between CGS members Lisa Gorrell and Tim Cox that turned into a wonderful graphic designed by Lisa's daughter Elizabeth Gorrell. What would be nice is to have a poster of it in every research facility – especially those with computers – to remind them that so little of their research will be found on the internet. Thanks to the efforts of Tim Cox, Lisa's dream has become a reality and the "Tip of the Iceberg" poster will make its debut on Friday at the Southern California Genealogical Society Jamboree. 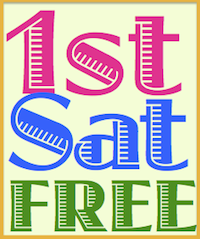 Tim informs me that an 11 x 17 full color poster will be available at Jamboree for only $10, including taxes and a protective cardboard tube, at the California Genealogical Society and Library table #114. Tim, Carolyn Steinberg and I will be staffing the table with some other CGS members so please stop by and see us. And consider purchasing a poster to donate to your local public library! Wow! This is great - I remember when you proposed the poster! Thanks, Thomas, for adding the poster to your blog Destination: Austin Family. I am going to get a poster this week end at the convention----very very cool graphics and a good reminder to all of us finding a name and date is just the start of the research. Please consider making the poster available by mail. I would love to have on for our research center.Some of us cannot make the trip to Oakland.